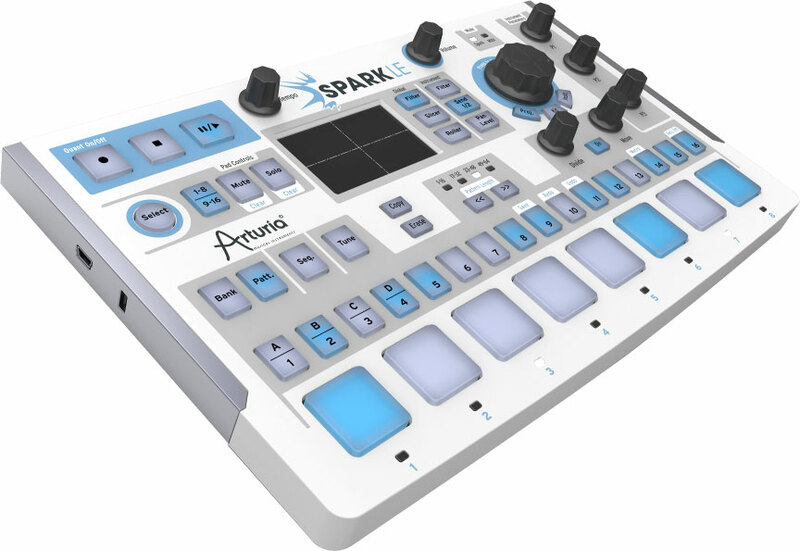 Last year the hardware meets software labs at Arturia presented us with their SPARK Creative Drum Machine. It was quite a standout as it combined your usual sample playback with their new True Analog Emulation synthesis technology that made for some unique layering and post-processing to your drum sounds. As NAMM 2013 came to a close the developers have unveiled a more mobile sister model the SparkLE, aimed at a larger base of producers willing to make room on their desk at a better price point. For now all we can look at pics, vids, and press releases but keep an eye out for a review in the near future when the SparkLE starts to hit the shelves in mid-March. SparkLE Creative Drum Machine serves up classic ‘TR-style’ workflow via its brightly backlit step sequencer buttons, while a musical platter of bangin’ beats can quite literally be banged out using its eight velocity- and pressure-sensitive backlit pads. Stunning live performances are a breeze thanks to the advanced Looper and beat-slicing functions, while beats can be transformed on the fly with the touch-sensitive FX pad that features eight filter modes (including the famed Oberheim SEM V filter featured in Arturia’s acclaimed Oberheim SEM V soft synth namesake) and seven Slicer modes. Three assignable encoders ease writing automation and realtime sound control. More musical still, TUNE mode permits playing sounds chromatically across those 16 step sequencer buttons or eight pads — try having the kick drum follow the bass root note for truly trouser-flapping lows, play a synth bass/lead sound, or transform percussion sounds into pitched instruments… it’s all there for the hands-on taking! Software-wise, SparkLE Creative Drum Machine makes use of the same full-featured Spark Engine software shipping with the original SPARK Creative Drum Machine. It includes an awesome library of over 1,500 instruments and 100 kits, providing top-notch, professional sounds covering a variety of dancefloor-friendly genres and stylings, ever-expandable with Arturia add-ons (like the Hip Hop Essentials and DubStep Essentials Expansion Packs). Priced to go, there has never been a better time than now to add a little sparkle to your rhythmic creativity with SparkLE Creative Drum Machine!